Prefer to drink your cake instead of eat it? 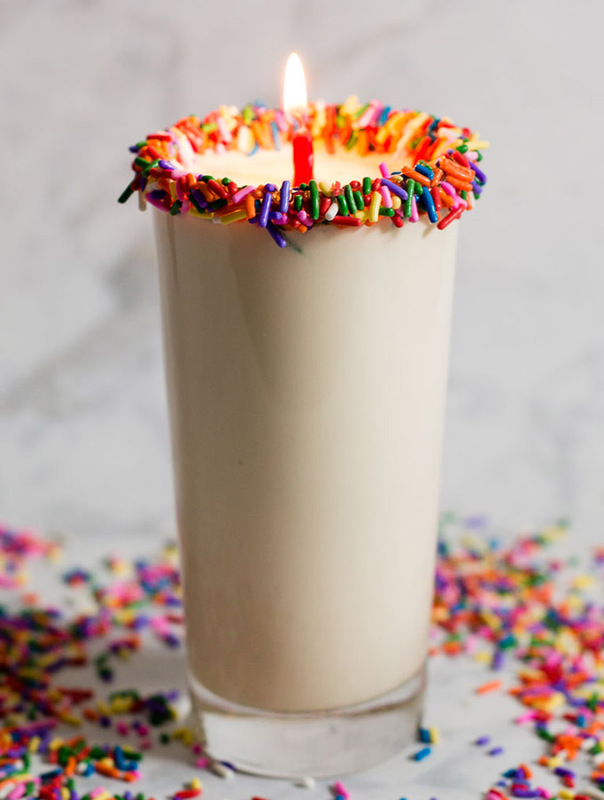 Blend up a birthday cake milkshake! Adults can add a shot of vodka for a little extra celebration. Yesterday was my birthday. I won’t say which one. I’m not exactly thrilled about being closer to 40 than to 30. It was a lovely day — Mother Nature gave me beautiful weather! We attended a bowling party for one of my son’s friends, then a birthday dinner at my parents’. Typically, my husband and my son make me a birthday cake, but since I was recently laid off, and my husband is trying to eat healthier, I didn’t want a whole cake in the house. Instead, I had a birthday cake milkshake! 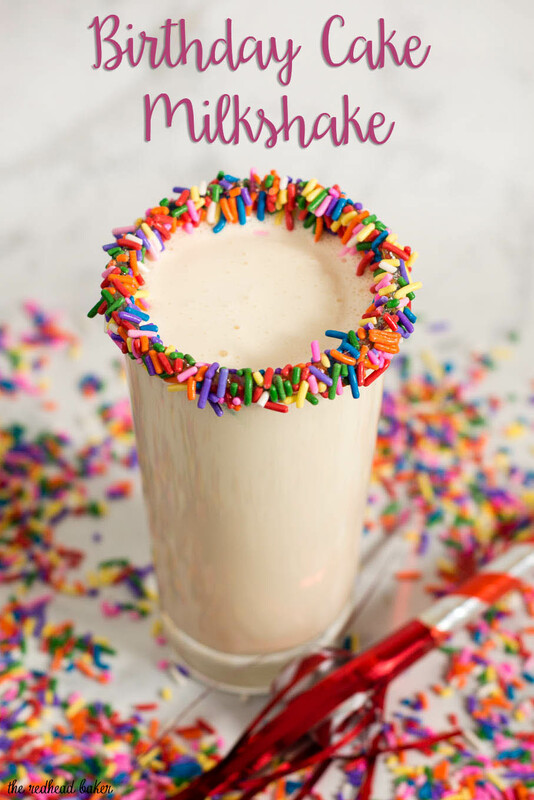 Kids and adults alike would love this milkshake that tastes like a slice of birthday cake. 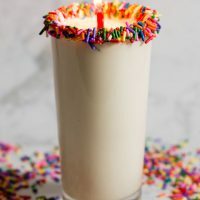 For the adults, you can add a shot of whipped cream or birthday cake-flavored vodka (or chocolate liqueur, or Bailey’s, or just about whatever liqueur you prefer!). Corn syrup around the rim of the glass helps the sprinkles adhere. 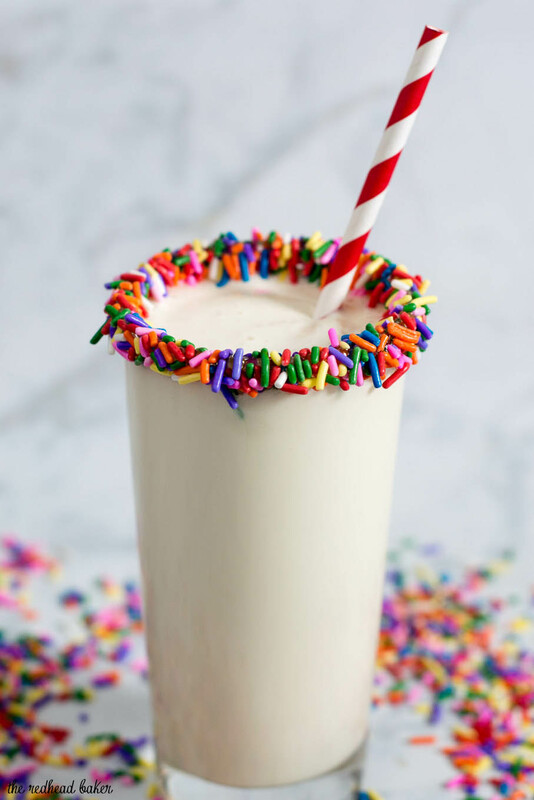 Unlike a margarita, water or vodka won’t do the trick here because of the weight of the sprinkles. If you want to use something like colored sanding sugar, vodka or water would work just fine. If you make just one milkshake, you can still use the remaining cake mix to make a cake or cupcakes. Removing just one quarter cup of the mix won’t affect anything. 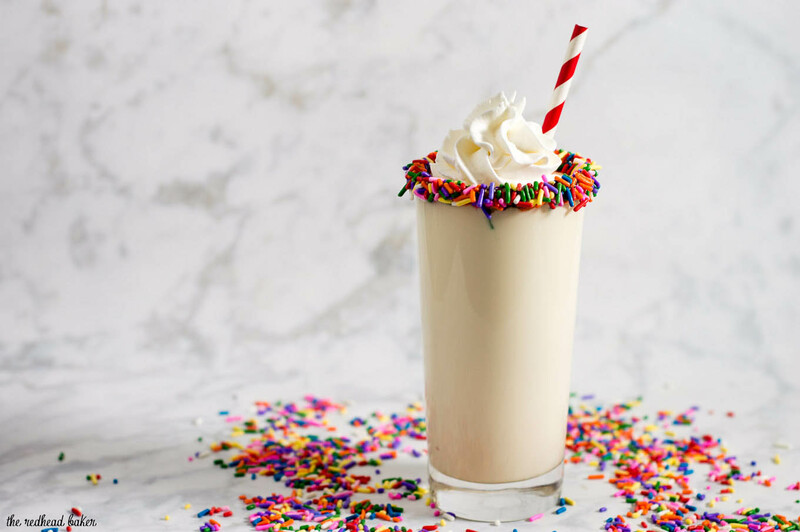 If you make more than one milkshake, however, but don’t want to discard the remaining mix, you could try birthday cake donuts, birthday cake popcorn, birthday cake pancakes, birthday cake bark, or birthday cake biscotti. Adjust the amount of milk or half-and-half to your preference. Less milk will make it thicker, more milk will make it thinner. 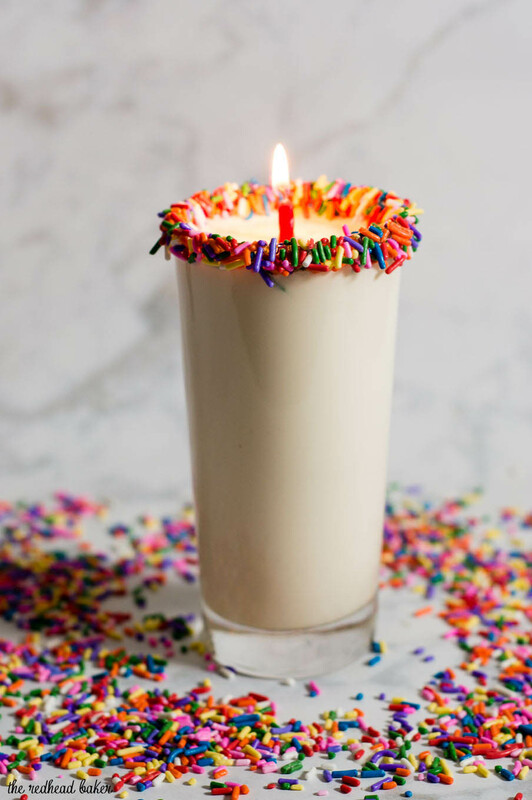 Top with whipped cream, a maraschino cherry, chocolate sauce, more sprinkles … it’s a birthday cake milkshake! Go crazy! Pour corn syrup into a shallow dish, and pour sprinkles into a second shallow dish. Dip the rim of a tall glass into the corn syrup, shake off excess, then dip in the sprinkles. Set aside. Place the vanilla ice cream, milk or half-and-half, vanilla extract, cake mix and vodka (if using) in a blender. Blend on high speed until fully combined. Pour into prepared glass, and garnish with whipped cream.